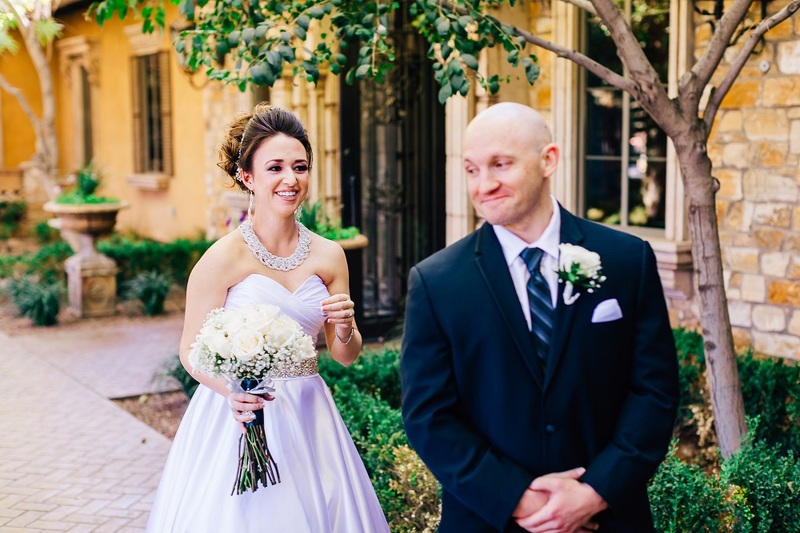 Alexis and Beau, who met when her father introduced them at the gym, were married on November 26, 2017. Alexis looked stunning in a strapless A-line gown with a sweetheart neckline, ruched bodice, jeweled belt, and full skirt. Her accessories included drop earrings and a collar necklace. Her bouquet was composed of white roses and baby’s breath. Her bridesmaids wore coordinating full-length slate-blue dresses, and carried smaller versions of the bride’s bouquet. Beau wore a dark blue suit with a white shirt, striped tie, white pocket square, and white rose boutonniere. The couple exchanged personal vows during the outdoor ceremony. The officiant also thanked all the law-enforcement officers present for their service (the groom is a police officer). Inside at the reception, guests dined on classic Caesar salad, braised beef short ribs, grilled chicken with prosciutto and provolone, tortellini primavera, and creamy mashed potatoes. The wedding favors were bottle openers. During the speeches, the best man joked about the groom. The bride’s father told the story of how he introduced the couple, and told her how much she means to him. The four-tier wedding cake had a white-and-gray marble look, and was decorated with silver roses and topped with an ornament featuring the couple’s last name. We wish Beau and Alexis all the best in their new life together! To view more photos from this wedding, please visit our Facebook or view our Photo Gallery. 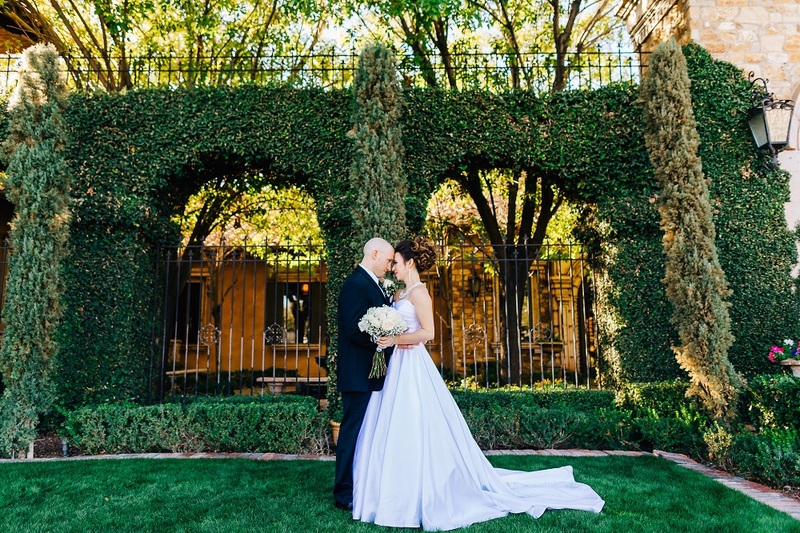 Arizona's most stunning venue for garden weddings. Serving Phoenix, Chandler, Gilbert, Mesa, Tempe, Ahwatukee, Scottsdale, Paradise Valley, Surprise, Glendale, Peoria, Buckeye & Maricopa. 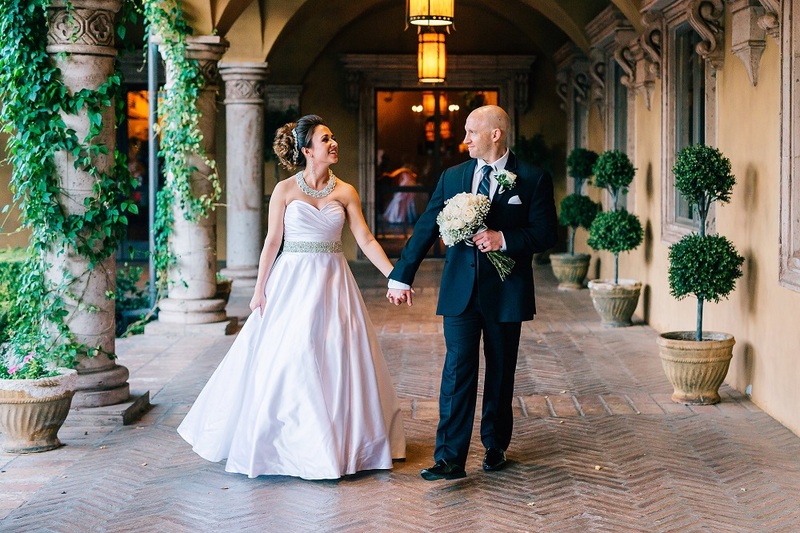 Copyright © 2009 - 2015 Villa Siena® All Rights Reserved.